Much like how a painter will use a variety of colors and brushstrokes, a landscaper must use a variety of plants, shrubs, and trees. If you want a beautiful landscape with plenty of visual interest, you need trees. 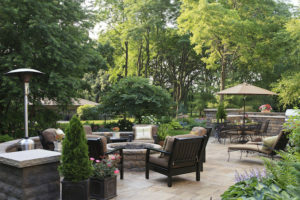 Along with their many air quality, shade, and temperature benefits they are used in landscaping to add height, dimension, and texture to a landscape. Much like how a painter will use a variety of colors and brushstrokes, a landscaper must use a variety of plants, shrubs, and trees. That said, the real conflict is deciding what trees to use, and where to put them. In your front landscape, the design needs are different, while you still want shade and beauty but you do not want to detract from your home or building. To this end, you will want to only choose trees with mature heights of 25’ or less. Dwarf varieties are a great option, as are small flowering trees such as apple and cherry. If you’re looking for a more subtle option, Japanese maple and dogwood trees are classic landscaping staples with beautiful foliage. At the rear of your property, height is less of a concern and the privacy providing nature of trees becomes useful. Large trees in the back can also provide shade and a cool area for a patio and deck. Tall, thick evergreens can be used to create a living privacy screen, while oaks, maples, paper birch, and poplar will create dense foliage to help shade your home. A backyard is also a great place for larger flowering trees such as lindens and tulip poplars. If you’re looking to have a focal point in your landscape, a tree might be a great option. Weeping willows, for instance, are beautiful and dramatic additions to a small pond or water feature. Some evergreens can also be trimmed into topiary for a wholly unique and fantastic focus. This entry was posted on Monday, July 30th, 2018 at 7:33 am. Both comments and pings are currently closed.